An adrenaline pumping speedboat ride will take you away from the clusters of people to sanctuary at the mesmerising Koh Hong Island, where you’ll find a unique post card quality beach, soaring limestone cliffs and a secret lagoon. 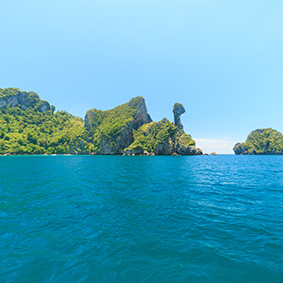 A day at Koh Hong Island is a day of swimming, snorkelling and sunbathing… what more do you need to relax? 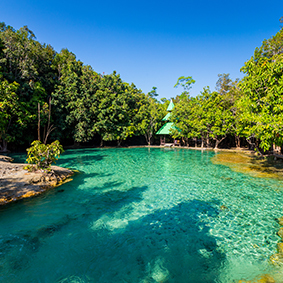 Koh Hong Island stands out as one of the most stunning islands residing on the Andaman coast and what’s more is that the crystal clear water inspires fantastic views of coral reef and marine life. Pelay Beach is covered in powder white sand and is surrounded by a wonderful coral containing clusters of beautiful fish. Are you interested in adding the Bali Eco Cycling into your Bali honeymoon itinerary? Contact us today! Departure Time 9am – Hotel pick-ups commence up to 60 minutes before the scheduled departure time.